This video demonstrates in detail the problems of this Miami flat roof and how the most trusted roofing company, Istueta Roofing plans on fixing them. Frank explains the removal phase of an old gravel flat roof that is going to be replaced with a new flat roof system. We’re shown what can happen when you wait too long to repair or replace a roof. The details of this roof are very important and are being tended to by the most experienced roofing contractors in Miami, FL. In this video Frank explains the removal of an old flat roof from the gravel, concrete and shingles to the proper installation of colonial red galvalume metal panels for the mansard and a brand new flat roofing system that will last for many years. 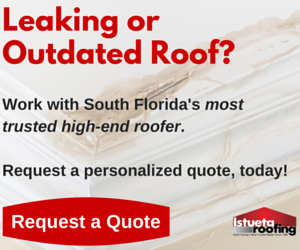 The best roofing company in Miami, FL exhibits how a new flat roofing system is properly installed. In this video Frank explains the components of the standing seam galvalume metal panels that are being installed by the most qualified Miami roofing contractor. The video also focuses on the new flat roof system being installed. This video demonstrates the precautions we take to ensure that our clients’ Miami homes are protected and that all debris is removed efficiently and safely from the job site.